I am loving everything about this photo snagged from Imprintables (and PS: Is everyone in Australia über creative? They have the best blogs!) 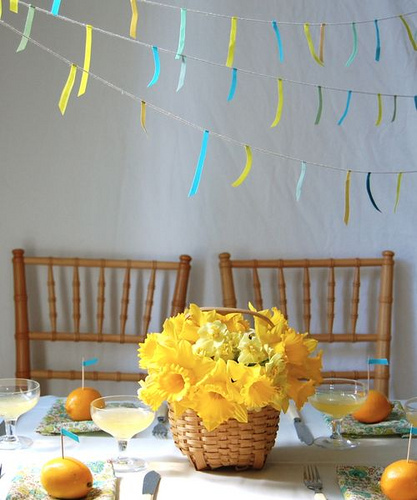 How sweet and simple is the ribbon bunting above the table? And what a dose of darling those flags in them there oranges are. Easy to copy, so I think I will. Now I just gotta come up with a reason to host a party! This entry was posted in idea thief and tagged bunting flags, idea thief, imprintables, party ideas, ribbon bunting by Annika. Bookmark the permalink. I love that ribbon bunting so much I think I would do that in a nursery – no party needed!